If music stores or orchestra leaders could simply buy one copy of sheet music and photocopy it for all their customers or band members, the composer and publishing house would not be able to make a living and create more unique music. Copyright laws protect composers and music publisher's rights; it is a violation of copyright law to reproduce sheet music without permission from the copyright holder. The copyright owner of a piece of sheet music owns the sole right to copy and distribute that sheet music including both the notes and words contained on it, according to the U.S. Copyright Office. Copying sheet music either by photocopier, scanner or by hand, or copying out any individual part or voice from that music without the express permission of the copyright owner is a copyright law violation. Illegal photocopying significantly diminishes the income of music composers, arrangers and publishers, according to the Music Publishers Association of the United States. Copyright violators may be sued for monetary damages. U.S. copyright laws provide some limitations on the copyright owner's rights for purposes of fair use of a copyrighted work such as sheet music. When sheet music has been lost immediately before a performance, such as when the luggage containing music does not arrive with a traveling orchestra, photocopies may be made provided that they are destroyed after use and replaced with legally purchased copies, according to the Music Publisher's Association of the United States. 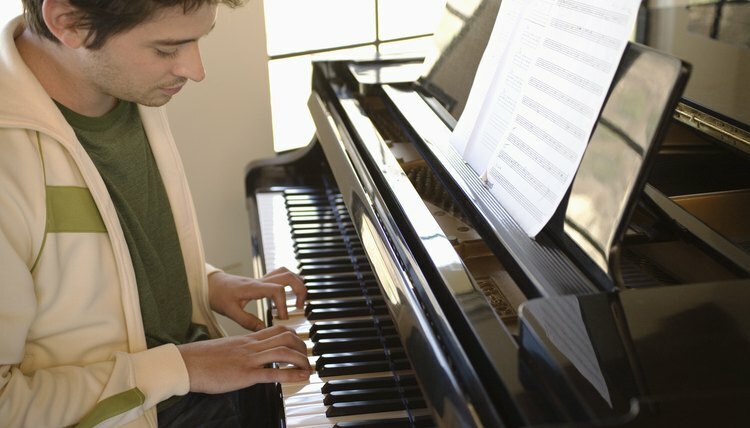 Small sections of sheet music may be reproduced for purposes of student study in an academic setting, such as a composition or music criticism class. A single copy of a sound recording of music played from sheet music can also legally be made by students for purposes of coursework and evaluation by their teachers as well. The owner of a copyright of a musical composition also has the exclusive right to make and distribute the first sound recording of that composition, according to the U.S. Copyright Office. Once a piece of music has been published and recorded, the copyright holder may not deny others a license, for a statutory fee schedule, to record and sell copies of the recording of the song. For this reason, some composers prefer to publish their music solely in sheet music form and not by means of a recorded demo track, as they may be able to sell that right of first recording for more money than they would receive for the statutory license fee for a subsequent recording. A person wishing to obtain permission to copy, perform or record copyrighted sheet music must locate the copyright holder, whose name is usually listed in a copyright notice printed on the sheet music. This copyright holder is often the music publishing company. Older sheet music may be in the public domain, meaning that the copyright has expired and anyone may copy or perform the music without license. Collections of sheet music in the public domain are published online by many academic institutions and private collectors, such as the Lester S. Levy Collection of Sheet Music at Johns Hopkins University, where viewers may download free copies of public domain sheet music without violating copyright law.